NEW YORK, January 28, 2014 – The South Jersey-based art and design firm of Ascalon Studios recently played an instrumental role in an award-winning world-class architectural project. The culmination of a six year effort and a $50 million budget, CetraRuddy Architects’ new Lincoln Square Synagogue (LSS) is the largest Jewish temple to be constructed in New York City in over 50 years, and the most expensive synagogue building ever to be constructed. The nation’s preeminent digest of architectural and design innovation, Interior Design Magazine, just honored the facility with a “best of” distinction in the 2013 Religious Institutions category. Ascalon Studios worked hand-in-hand with the project architects and design committee towards the beautification of the building’s impressive sanctuary space. The studio’s principal, the noted artist David Ascalon, together with sons Brad and Eric Ascalon, comprised the team that designed and implemented artwork and decorative elements for the sanctuary, including the Modern Orthodox temple’s aesthetic and spiritual focal-point: its Aron Kodesh. The Aron Kodesh, or “sanctuary ark”, is the structure at the front of a synagogue sanctuary which houses its “Torahs”, the holy scrolls containing the hand-inscribed Hebrew bible. 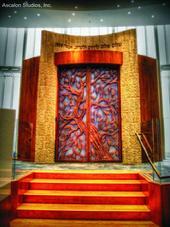 In the case of LSS, the ark is a graceful 15-foot-tall edifice composed of a curved arrangement of Cedar of Lebanon wood and Jerusalem Stone, with hand-sculpted artistic bronze doors depicting a flowing olive tree. 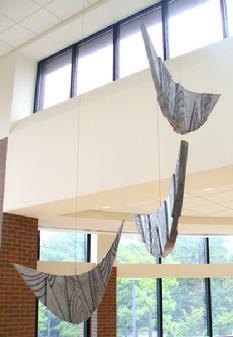 The Ascalons’ design for the artwork was implemented by the studio’s staff in its metropolitan Philadelphia facility, and transported to New York for installation. Exterior facade of Lincoln Square Synagogue. CetraRuddy Architects. 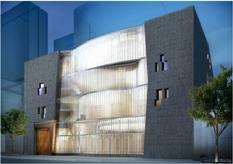 Sanctuary ark for the new Lincoln Square Synagoue, New York City. Designed and implemented by David Ascalon with Brad Ascalon and Eric Ascalon. 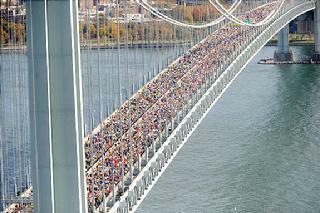 Copyright Ascalon Studios, Inc.
February 14, 2011, West Berlin, New Jersey - Ascalon Studios' General Manager, Eric Ascalon, has been training for the 2011 ING New York City Marathon, which he hopes to complete this coming November. Eric, a one-time avid runner and cyclist, had taken a hiatus from endurance sports for the good part of the past decade, but hopes, now, to reverse that trend. In the process, with the support of Ascalon Studios, he will be raising money for "Team for Kids", a non-profit organization dedicated to the creation of programs in low income schools and communities to combat childhood obesity and its associated ailments. Will Eric achieve his goal? We don't know. But you could certainly help motivate him by making a tax-deductible donation to "Team for Kids", a very worthy cause. To make a contribution to Team for Kids, or for updates on how training is going, click on the image to the right. Ascalon Studios recently undertook the design and implementation of Phase I of a leaded stained glass window surround entitled "The Presence" for the nondenominational "Chapel for All Faiths" at Robert Wood Johnson University Hospital in New Brunswick, New Jersey. 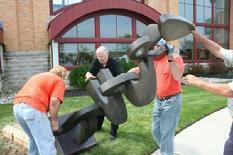 The artwork was commissioned by the hospital's volunteer auxiliary. Given the nondenominational nature of the space, the client sought to convey, in the artwork, a sense of a supreme being, force, or spiritual presence without alluding to a specific belief. This was accomplished through abstract bursts of color emanating from an upper-left hand focal point, set on a background composed of rectilinear forms. 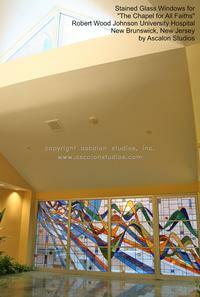 This contemporary artwork was designed and constructed through centuries-old leaded stained glass techniques at Ascalon Studios' Philadelphia area studio. Materials include a combination of hand blown and specialty art glass. The artwork installation is part of a recently completed comprehensive renovation of the chapel, which serves the daily ecumenical and meditative needs of hospital patients, visitors, and staff members from a wide array of religious faiths and spiritual persuasions. A re-dedication ceremony for the renovated chapel was held on March 23, 2010. Founded in 1884 and based in downtown New Brunswick (close to the campuses of Rutgers University and the University of Medicine and Dentistry of New Jersey), Robert Wood Johnson University Hospital ranks amount the nation's leading academic medical centers. 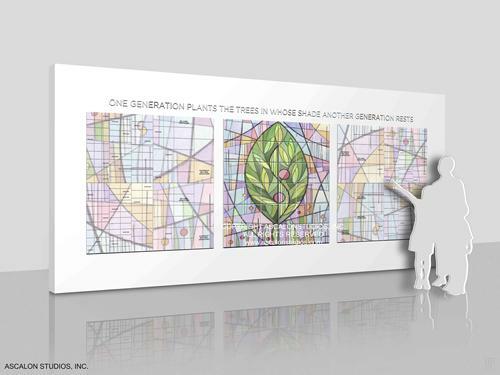 Ascalon Studios, based in the Philadelphia area, undertakes the creation of stained glass windows, site-specific artwork, and donor recognition projects for worship, public, and institutional spaces throughout North America. Example application of Ascalon Studios' new fired ceramic recognition system. Ascalon Studios, a leader in the creation of innovative donor recognition solutions nationwide, unveiled its new fired ceramic recognition system at the AFP's 2010 International Conference on Philanthropy at the Baltimore Convention Center. Ascalon Studios' exciting new system utilizes durable kiln-fired materials integrating custom-designed artwork and images. Each project is uniquely and economically designed and implemented to meet the client's aesthetic criteria and practical donor recognition needs. Projects are created through an environmentally friendly process with the option of utilizing TerraGreen(R) Ceramics, a certified recycled product. Projects are suitable for indoor or outdoor applications. In addition to large-scale centralized donor walls, the fired ceramic technique can be utilized for the creation of history displays, as an aesthetic alternative to traditional location-specific recognition plaques, or as customized presentation gifts for high-dollar donors. The fired ceramic donor recognition system is the latest in Ascalon Studios' array of innovative donor recognition alternatives. For more information, contact Ascalon Studios by phone at 1.888.280.5656, via email at info@ascalonstudios, or click on the image to the left for an online contact form. Installation of David Ascalon's "Totem"
In addition to Ascalon's Totem, the library has secured other impressive works, including a life-size piece by the realist sculptor Seward Johnson entitled "Sunday Morning". 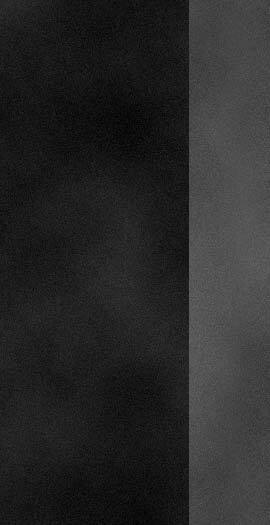 Ascalon's Totem, an ethereal, monochromatic, rising conglomeration of abstract forms, contrast's sharply with Johnson's colorful, realistic casting, which includes a man lying in the grass, reading the New York Times. Artist David Ascalon (b.1945), a graduate of New York's Pratt Institute, has been a Philadelphia-area fixture for a quarter century now. The South Jersey-based art and design firm that he heads, Ascalon Studios, has, for three generations, engaged in the artistic adornment of worship and public spaces throughout North America. 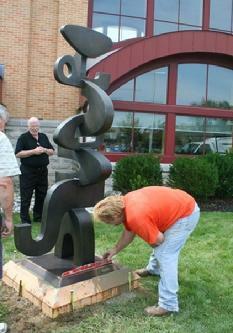 Ascalon's monumental public sculpture, as well as his immense contemporary stained glass windows, donor recognition projects, and other commissions can be seen throughout the United States. Among the flora in the New Jersey Pine Barrens. Ascalon Studios is proud to announce its relocation to its new headquarters, which occupy a two acre wooded site at the edge of the Pinelands National Reserve in West Berlin, New Jersey. This is the first move for the studio in 23 years. Still within the Philadelphia metropolitan region - and only ten minutes from its former facility - the new Ascalon Studios is a larger, better equipped, state-of-the-art venue for the design and fabrication of its site-specific and monumental art and design projects. We will certainly miss our former site, which was in a cramped industrial complex adjacent to the "Atlantic City Express" railroad tracks (which we have called home since 1985). Nevertheless, we are excited and look forward to the creative inspiration that could be garnered by our new neighbors: the pine trees and the mighty oaks. 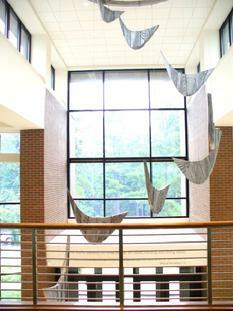 Ascalon Studios' "Wings to the Heavens" Kinetic Mobile Sculpture Installed in Memphis. 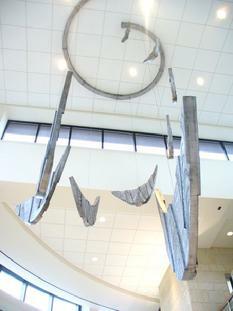 These new images reveal the ever-changing form of Ascalon Studios' 30-foot high "Wings to the Heavens", an abstract kinetic mobile sculpture recently installed in the grand lobby atrium of Memphis' Temple Israel. The composition, created of welded aluminum and stainless steel, was designed and implemented by David Ascalon with sons Brad Ascalon and Eric Ascalon. The design process included the development of prototypes, models, and computer aided drawings to assure both the visual and functional integrity of the artwork. 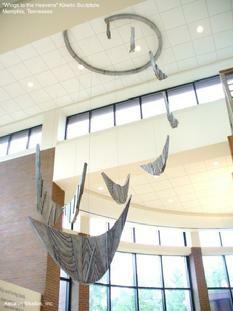 "Wings to the Heavens" Kinetic Mobile Sculpture by David Ascalon, Ascalon Studios. Prominent Publication Names Brad Ascalon among "10 Most Wanted Designers"
The highly acclaimed international journal of design, Wallpaper, has selected Brad Ascalon as one of ten "Most Wanted" designers in their annual Design Directory issue. The list comprises individuals from around the world that the editors deem to be the "brightest young talents" in the realm of design. Brad, the son of Ascalon Studios principal David Ascalon, has played an instrumental role in a number of the Studio's projects in recent years. He is presently completing his work towards a Masters in Industrial Design at New York's Pratt Institute and serves as an intern with the prominent industrial design firm of Karim Rashid. 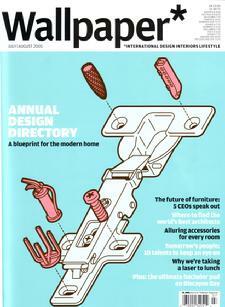 Wallpaper's 2005 Design Directory can be purchased at newsstands and bookstores throughout North America and Europe until the end of August. Ascalon Studios' General Manager, Eric Ascalon, cycled in this year's MS 150 "City to Shore" Bike Tour, a round-trip ride between the Philadelphia area and Ocean City, New Jersey to benefit the National Multiple Sclerosis Society. This year's event, which marked "Team Ascalon's" third year participating, took place the weekend of September 24th. Day One of the tour consisted of a 100 mile winding trek from the outskirts of Philadelphia, through New Jersey's Pine Barons, concluding at the Jersey Shore. Day Two consisted of a more direct 75 mile ride back to the Philadelphia area. In sum, 7100 cyclists participated in the event, which raised in excess of $3.5 million to help fight MS. Multiple Sclerosis is a devastating autoimmune disease that affects the central nervous system, and can attack otherwise healthy people at any age. 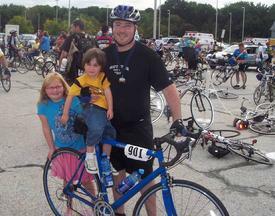 For more information on MS and the MS 150 Bike Tour, click here. 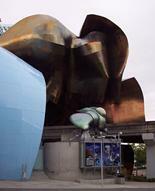 Opening to the public on June 18, 2004, The Science Fiction Museum and Hall of Fame is located in the landmark Frank Gehry building at the base of Seattle's Space Needle. The museum, the brainchild of Microsoft cofounder Paul Allen, features an array of high tech displays and interactive experiences that explore the history, literature, and technologies behind the science fiction genre. The entrance of the museum features a space age "Founders' Circle", which serves as a donor recognition display to the founders and major benefactors of the museum. The Founders' Circle was designed and fabricated by the art and design firm Ascalon Studios, which won a design competition for the commission. The donor project features a matrix of edge lit glass cylinders of various sizes, which serve as very unconventional donor plaques. The design incorporates a futuristic look to compliment the "space age" theme, flow and style of the museum and of the building as a whole. The Founders' Circle project was designed and constructed in a compressed period of only a few weeks to meet the museum's rapidly approaching opening. According to the project's chief designer Eric Ascalon, "This is perhaps the most 'far-out' donor recognition display ever created. It is very different from the more traditional sorts of donor walls we are normally commissioned to undertake." From the custom cut glass cylinders (specially manufactured by a scientific glassware company), to the brushed aluminum pilasters and sophisticated edge lighting, virtually all the materials, components and methods used in this project were new to the firm, "and that is what made the project's rapid execution so exciting and rewarding." Ascalon further acknowledges that it is also quite an honor to have completed a work that will be permanently located right at the entranceway to a landmark building by such a preeminent architect as Gehry. While this sort of space age project is not the norm for Ascalon Studios, it does demonstrate the firm's vast capabilities and versatility. The project's assistant designers were David Ascalon and Brad Ascalon. 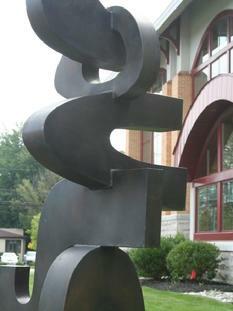 Cherry Hill's celebrated Appel Art Gallery will welcome a retrospective exhibit of the art and sculpture of David Ascalon during the months of November and December 2004. David Ascalon is the principal of Ascalon Studios, an art and design firm dedicated to the adornment of worship and public spaces throughout North America. While Ascalon, an alum of New York's Pratt Institute, has spent the greater part of the past quarter-century devoted to his large-scale commissioned and public art projects, over the years he has created a variety of private sculptures for his own personal collection. This exhibit will feature a number of these smaller works, which primarily consist of cast and fabricated bronze sculpture enhanced with various patinas. There will be a gallery reception on Sunday, November 7th at 4 p.m. to coincide with the opening of the show, at which time Ascalon will present a short lecture on his work and background. The foundation of David Ascalon's work is his heritage; tradition melded with an artistic lineage and built upon the premise that an artist should give something of himself to others. His work is unique, bold, surging with emotion, reflecting the mood of the artist at the moment of it's creative conception. The exhibit will be located at The Appel Art Gallery @ The Katz JCC Campus, Springdale & Kresson Roads, Cherry Hill, New Jersey. 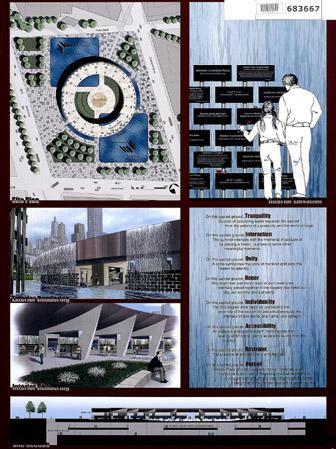 In collaboration with the noted Owings Mills, Maryland architectural firm of Levin/Brown & Associates, Ascalon Studios submitted its proposal for a memorial to the victims of the September 11, 2001 terrorist attacks. The design features twin reflecting pools that occupy the footsteps of the former Twin Towers, corners of which are intersected by a massive yet graceful stainless steel circular canopy. Beneath the canopy will be a matrix of memorial stones, one dedicated to each victim. The victim's name would be carved upon his or her stone, with the opportunity for the family to inscribe an appropriate epitaph or words of remembrance. The family would also have the option of encapsulating a momento of their fallen loved one within their respective stone. There would be spaces between the memorial stones where loved ones or visitors could leave flowers, notes, or other dedications. From atop the circular canopy would fall a stream of water - behind the matrix of memorial stones and into the reflecting pools - symbolic of the tears shed in the aftermath of the tragedies. The falling water would create a peaceful white noise throughout, having the effect of insulating the memorial site from the audible distractions of the city. The design also provides for an elegant sloping amphitheater within the canopy, which would serve as a place for quite reflection or as a venue for solomn public commemorations regarding the tragedies. 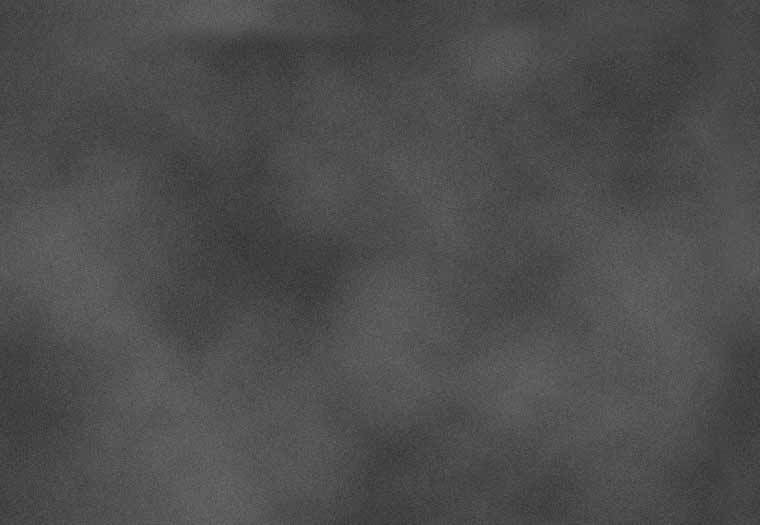 Design team member David Ascalon comments, "The fundamental premise of our concept is that it is absolutely necessary to preserve the footsteps of the Twin Towers - for this is hollowed ground. The creation of the reflecting pools will assure that the sanctity of the ground is maintained." A decision by the Lower Manhattan Development Authority, the organization administrating the design competition, is not expected for several months. It may be years before the final memorial design is actually implemented. 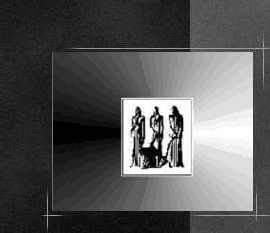 All artwork, designs, and images are the copyright of Ascalon Studios, Inc.